Divas also shaped the musical canon. They were the vocal interpreters, the charismatic vehicles for composers’ messages. 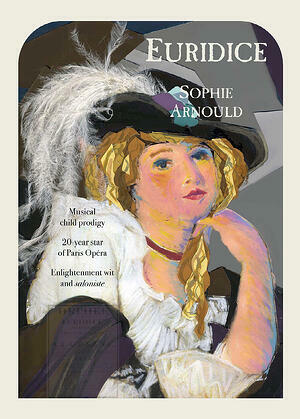 An opera’s success depended on diva star power and her musical interpretation. Giacomo Puccini composed the music for Tosca with Romanian diva Hariclea Darclée in mind. Darclée suggested and shaped the aria "Vissi d’arte—one of the opera’s most famous arias and arguably one of Puccini’s most transcendent arias. Their fame and wealth made divas role models for female agency. When contemporary women take on the diva identity, it is in homage to all the powerful women who’ve come before. The story of a diva is not one of frivolity and caprice but of grit and survival. I had the opportunity this week to talk with fashion historian and visual artist Kathleen McDermott, creator of DIVA Museum and historical diva consultant for DIVAS, the new play with opera music. DIVAS is the story of nine of these remarkable women set alongside arias that made them famous. The play showcases the divas, their stories, music, and larger-than-life fashion, along with their contributions to women’s history. 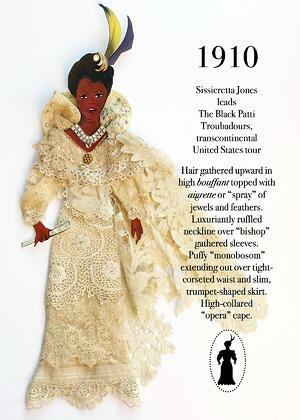 Why is it difficult for us today to understand diva culture of 1700 to 1920? Divas were social outcasts. People acknowledged their artistry so long as everyone was clear about social limits and class lines. Men could throw a singer a fortune in jewels at curtain calls and that was accepted. A man could have affairs and mistresses amongst female performers and that was okay too, but he would never marry one. In the years before social safety nets, a singer had to amass enough money during her onstage years so that she could live in retirement. She had to run her own life, make her own decisions, and deal with the backlash that entailed. Today, opera stars speak of fellow singers with gratitude for their collegiality and professionalism. That’s not how it was. Back then, a diva’s onstage job—it was a matter of survival—was to outshine every single other person there. Part of a diva’s survival strategy was to make herself a large, imposing presence. In this respect, fashion was an important part of the whole diva persona. In the second half of the 19th century, many diva stage costumes were haute couture gowns from Paris; that was one reason why divas traveled with so many trunks. It’s also important to have a feminist understanding of diva jewels, which were her personal safety net. There were so few legal protections in place for women in general and for women who earned their own money. Jewels were easy to hide from grasping fathers and husbands. Together, jewels and couture reinforced the “goddess” mystique. Today, with a social safety net in place and greater legal protections, opera singers don’t have to be goddesses, just supremely-gifted singing professionals. As interpreters, divas are treated less well by history than composers. We remember the composers—mostly men—because their work was written down. (People are only just now celebrating the few historical women composers whose work was preserved.) Of the 26 divas in DIVA Museum, only a few lived into the age of recorded sound and that sound was primitive. So these women were evanescent interpreters. We do have written reports telling us what great singers from 1700 to 1920 sounded like, but we can’t hear their artistic genius or vocal charisma. What we can understand is the effect that the divas had on people. They were enormous cultural figures--tens of thousands of Italians routinely lined up to hear Maria Malibran in the 1830s. I study these women that way, as cultural figures of great significance. They were women who not only pioneered important roles in the musical canon but advanced the feminist agenda. I look at them as huge lives pushing women’s advancement forward. Each of my 26 divas did it differently. Some were musical innovators, others worked actively in the political process. They are great role models because they remind us that we can each make social change in our own way. 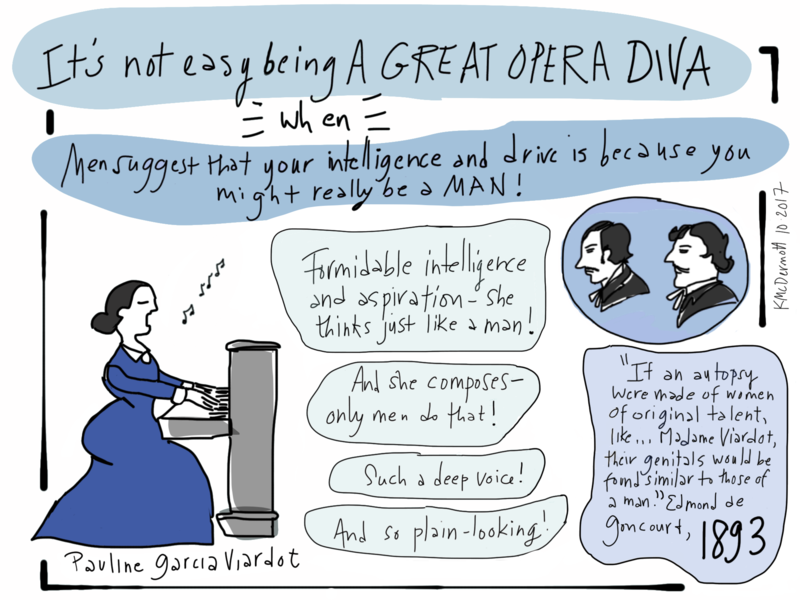 Could an argument be made that the success of a composer’s opera was reliant on the diva? Yes, absolutely! Some composers composed together with the diva or had an individual singer’s voice in mind. I can’t even imagine the anxiety a singer must have had on a day-to-day basis. If she got sick, it could have enormous negative consequences. Yes! Many tried to make careers as opera singers but only a few became divas. Those who succeeded were indeed Olympians—with enormous stamina, charisma, personal power, strength of will, ambition. And they needed every bit of this personal power. 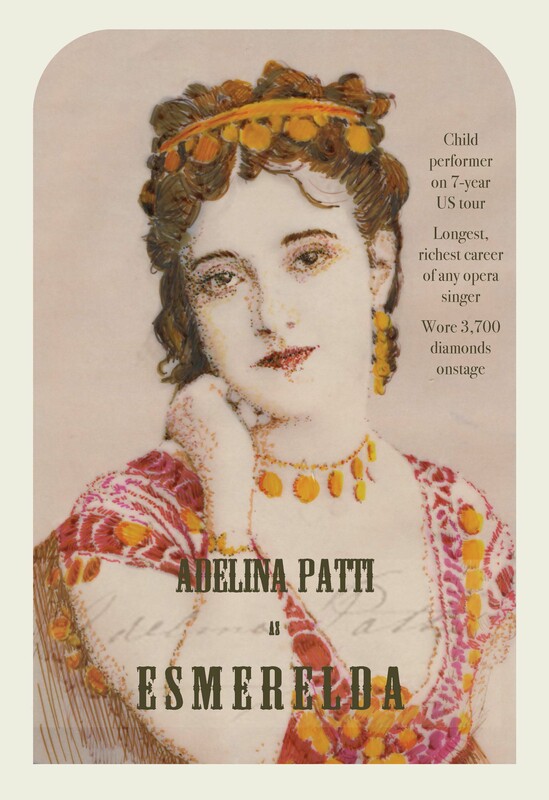 Adelina Patti had a 54-year career before an adoring public. She was a towering musical and cultural force and showed that a woman could earn her way to fame, influence, and wealth. The divas had to be very shrewd and calculating in every facet of their lives. Yes, singers’ lives were so different then. Today, people pursue artistic careers as a means of self-expression. For women singers in the period from 1700 to 1920, it was more about survival. 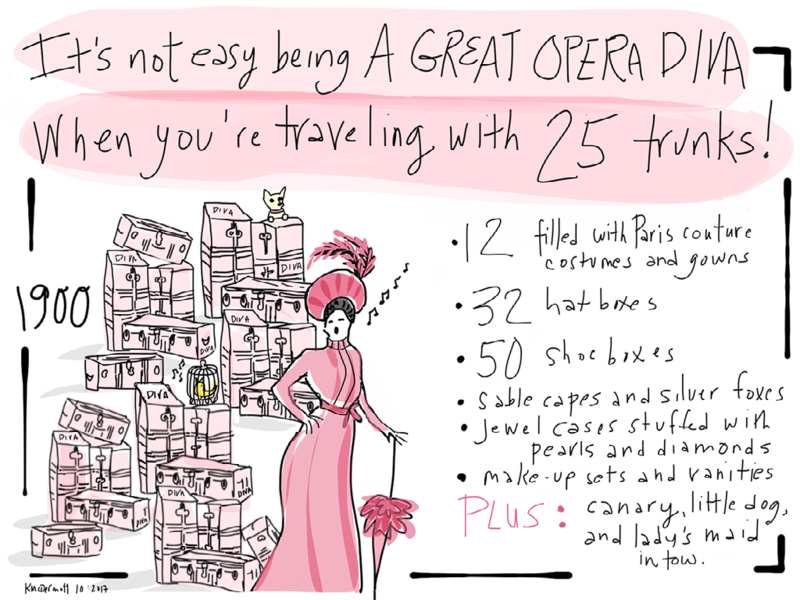 OperaHub’s DIVAS showcases 9 divas of the 26 in DIVA Museum. Why? That choice was made by the producers at OperaHub and by playwright Laura Neill. I think that part of the choice had to do with lives that have relevance and resonance to our world today. Sissieretta Jones, for example, was an African American singer of great talent and influence who faced racism and hardship. We need to talk about her life. Pauline Viardot had a “dark” coloratura voice and composed music, a field reserved to men at that time. Misogynistic 19th-century men speculated that she was a hermaphrodite—that’s what happened to women who stepped outside the narrow boundaries of acceptability. Sophie Arnould was an outspoken 18th century French Enlightenment woman of clever wit and deep education; we want to understand how her quick thinking saved her from the guillotine. On a larger level, the show was commissioned to create nine starring roles for women. The characters reflect the complexity, agency, purpose, and vocation of real women’s lives today. You’ll see all that complexity when the divas are assembled together and hear how they talk about issues in their lives. I got started with the divas because I love the gorgeous images—in paintings and photographs—that they left behind. Yet over the years that I’ve spent with them, I’ve come to realize that part of the power of these images comes from their lives of leadership and achievement.